BT840F is an advanced, highly flexible solution for today's increasingly demanding Ultra Low Power, Ultra Long Range, and higher throughput applications in the IoT world. Inherent industry-grade security is essential in today's applications, a cryptographic accelerator is embedded. BT840E is a sister module with an u.FL connector for external antenna. BT840 is a lower cost, $6.88 at 1-pcs, smaller size, shorter range alternative of BT840F. USB840F: nRF52840 USB Dongle, pre-certified and in market ready enclosure. BWG840F: BLE 5, Thread, Zigbee to WiFi gateway. BLG840F: BLE 5, Thread, Zigbee to LTE gateway (coming soon). BT840F uses a superior PCB trace antenna, proofed in BT832F module to have the longest range at +4 dBm transmission power at 1Mbps data rate. Adding +8dBm transmission power and 7 dB receiver gain for FEC (Forward Error Correction) in CODED PHY, range between two BT840Fs will is 2300 meters at 125 Kbps when multiple path interference is low. Embedded CryptoCell 310 co-processor can be used to provide more secure connection and to prevent hacker. Develop an IoT product using BT840F, $8.24 each at 1K pcs. If 650 meters range, 256KB flash/64KB RAM are enough, replace it with BT832F, $5.22 each at 1K pcs. If 100 meters range is enough, replace it with BT832, $4.73 each at 1Kpcs. No change to main board hardware is required. Nordic nRF52832 SoC supports 2 Mbps data rate and firmware upgrade with new SoftDevices can transmit broadcasting messages up to 255-bytes long. All BlueNor modules, BC832, BT832, BT832F, and BT832X support these two Bluetooth 5 specifications. Bluetooth SIG CORE_v5.0 LE CODED PHY uses FEC (Forward Error Correction) codes, 8 or 2 symbols to represent 1 data bit, and 1 M Symbols per second (MSps) transmission rate. Effectively, the maximum data rate is 125 kbps when 8 symbols are used. This FEC coding allows receivers to receive much weaker signals and to increase range by 4 times in theory. Typical BLE 4.2 range is about 50 meters. This CODED-PHY can quadruple the range to about 200 meters at reduced data rate of 125 kbps. BlueNor BT832F uses a superior PCB trace antenna to increase Bluetooth range to 650 meters between 2 modules. If you are developing a product meeting Bluetooth 5 specifications, BT832F is a good, lower cost alternative. BT840F is required if your Bluetooth 5 devices are used in mesh networks with many nodes for desirable performance. Security is mandatory in Bluetooth mesh networks. By offloading decryption, encryption, and authentication works to CryptoCell-310, BT840F can deliver high performance in Bluetooth mesh networks. Mesh network, individual applications, and Bluetooth 5 devices are all secure. This cannot be switched off or reduced in anyway. All mesh messages are encrypted and authenticated. Network security, application security, and device security are addressed independently. Security keys can be changed during the life of the mesh network via a Key Refresh procedure. Message obfuscation makes it difficult to track messages sent within the network providing a privacy mechanism to make it difficult to track nodes. Mesh security protects the network against replay attacks. The process by which devices are added to the mesh network to become nodes, is itself a secure process. Nodes can be removed from network securely, in a way which prevents trashcan attacks. Three security keys provide security to different aspects of the mesh and achieve a critical capability in mesh security, that of "separation of concerns". NetKey (network key) possessed by all nodes. It allows a node to decrypt and authenticate up to the Network Layer. A Relay node uses NetKey to decrypt and authenticate messages before relaying. AppKey (application key). Application data for specific application can only be decrypted by nodes possess the right AppKey. DevKey (device key) is unique to each node. It is used for secure communication with the Provisioner during provisioning process. In a mesh network with many nodes, a lot of processing power is required for decryption and authentication at least for the Relay nodes and possibly for other nodes. BT840F using nRF52840 is embedded with an ARM CryptoCell-310 cryptographic co-processor. 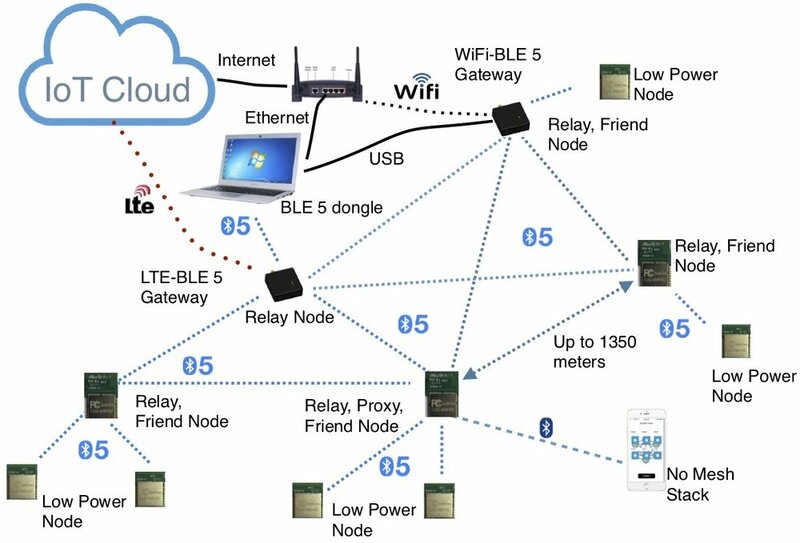 To achieve acceptable mesh network performance, BT840F should be used in mesh networks with many nodes. Cryptographic hardware engines, providing CPU host offloading, operation acceleration and power consumption reduction. By offloading decryption, encryption, and authentication works to CryptoCell-310, BT840F can deliver high performance in Bluetooth mesh networks. Bluetooth ranges between 2 modules are measured with antenna pointing to sky, one antenna is rotated by 30 degrees after each measurement, average of 12 measurements for each test condition. TX= +8 dBm, 1000 meters at 1 Mbps. Antenna is 5.2 meters and 4.2 meters above ground, respectively. TX= +8 dBm, 2300 meters at 125 Kbps. Both antennas are 5.2 meters above ground. At typical height of thermostat, antenna 1.52 meters (5 feet) above ground. TX= +8 dBm, 640 meters at 125 Kbps. TX= +8 dBm, 390 meters at 1 Mbps. Note: Range of BT832X is measured with antenna at 2.1 meters above ground. With 1170 meter range, BT832X Bluetooth signals can penetrate more walls than BT840F with 2300 meter range at 5.2 meter height. Multiple path interference can reduce range significantly. Price of BT840F is $7.78 each at 1000 pcs. For volume discount and production lead time, please email Fanstel. Long range nRF52840 module, 510 meters at 1Mbps. EV BT840F has the same footprint as Arduino UNO R3. It is not an Arduino compatible board. You need Nordic development tools for firmware development. Most of Arduino UNO R3 shields can be used with EV BT840F. You can take advantage of Bluetooth 5 advanced features when used with Arduino shields. A single order is preloaded with SLAVE firmware for used with Nordic nRF connect.